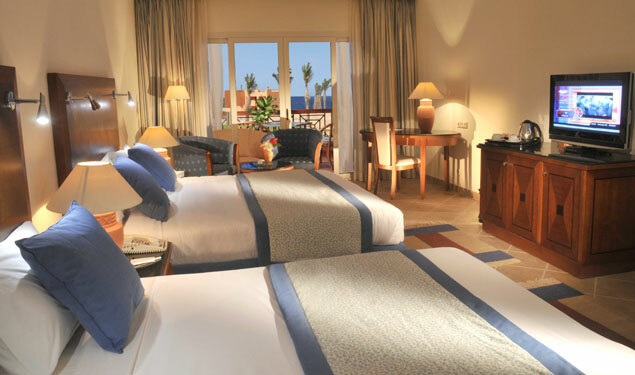 The luxurious Jaz Grand Marsa (formally the Jaz Grand Resta) has a very open feel, with buildings dotted around beautifully landscaped gardens. There’s an impressive swimming pool area, complete with swim up bar, perfect for lazing and cooling off, and you are never more than a short stroll from the golden sandy beach. The à la carte restaurants have plenty to tantalise your taste buds, and you’ll find loads to do from darts to diving, saunas to sightseeing. The hotel enjoys a beachfront location just 10 minutes by taxi from the shops, bars and restaurants of Port Ghalib marina. All rooms feature a balcony or terrace, king or twin beds, bath with shower, air conditioning, safe, mini-bar*, tea/coffee facilities, telephone*, satellite TV. • Standard Rooms sleep 2 adults/2 children and have a garden view. • Pool View or Sea View rooms are also available.